The membrane-bound cell-surface precursor and soluble forms of heparin-binding epidermal growth factor-like growth factor (HB-EGF) contribute to many cellular developmental processes. The widespread occurrence of HB-EGF in cell and tissue types has led to observations of its role in such cellular and tissue events as tumor formation, cell migration, extracellular matrix formation, wound healing, and cell adherence. Several studies have reported the involvement of such extracellular matrix proteins as latent transforming growth factor β-binding protein, TGF-β, and fibulin-1 in some of these processes. To determine whether HB-EGF interacts with extracellular matrix proteins we used the extracellular domain of proHB-EGF in a yeast two-hybrid system to screen a monkey kidney cDNA library. 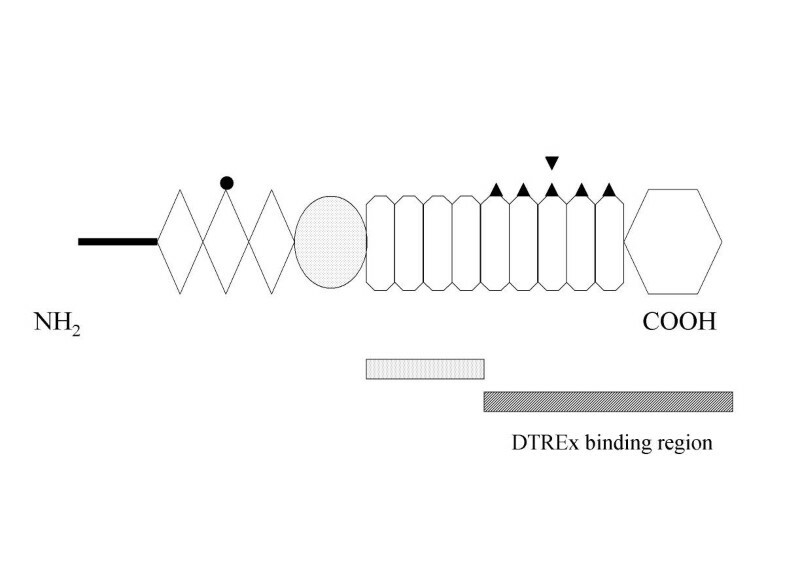 cDNA clones containing nucleotide sequences encoding domains of two proteins were obtained and their derived amino acid sequences were evaluated. From ≈ 3 × 106 screened monkey cDNA clones, cDNA clones were recovered that contained nucleotide sequences encoding domains of the monkey latent transforming growth factor-β binding protein-3 (MkLTBP-3) and fibulin-1C protein. The amino acid sequence derived from the MkLTBP-3 gene shared 98.6% identity with human LTBP-3 and 86.7% identity with mouse LTBP-3 amino acid sequences. The amino acid sequence derived from the monkey fibulin-1C gene shared 97.2% identity with human fibulin-1C. Yeast two-hybrid screens indicate that LTBP-3 and fibulin-1C interact with proHB-EGF through their calcium-binding EGF-like modules. The interactions of the extracellular domain of proHB-EGF with LTBP-3 and fibulin-1C suggest novel functions for HB-EGF between cell and tissue surfaces. The precursor of heparin-binding EGF-like growth factor (proHB-EGF) is found on a wide variety of cell surfaces and is present in numerous tissue types . Previously in our laboratory, we cloned the cDNA encoding proHB-EGF from monkey Vero cells and identified this cell-surface molecule as a receptor for diphtheria toxin (DT) . The predicted amino acid sequence was shown to be identical to that of the cell surface-expressed precursor of human heparin-binding EGF-like growth factor (proHB-EGF) [3, 4]. The derived amino acid sequence revealed a signal sequence (residues 1–23), an extracellular domain (residues 24–159), a transmembrane domain (residues 160–184), and a carboxyl terminal cytoplasmic domain (residues 185–208) . Proteolytic processing of the proHB-EGF occurs on the cell surface and results in the release of mature HB-EGF (mHB-EGF) (residues 63–148) . The mature/soluble HB-EGF is a member of the EGF family of growth factors that includes amphiregulin, epidermal growth factor, and transforming growth factor a . Mature HB-EGF released from the cell surface is mitogenic and is able to bind to the EGF receptor . Membrane-bound proHB-EGF has juxtacrine growth factor activity  and also acts as a DT receptor [2, 8]. Previously we have described the interaction of the extracellular domain of proHB-EGF with the second extracellular domain of the tetraspanin protein, monkey CD9 . Tissue culture experiments using DT-sensitive transfected mouse fibroblast cell lines expressing on the cell surface both the monkey DT receptor and chimeric mouse-monkey CD9 antigen showed that the second extracellular domain of monkey CD9 antigen is able to act as a coreceptor for DT and is also responsible for the increased DT-sensitivity and affinity for DT in these cell lines . These observations suggested that the CD9 antigen and proHB-EGF likely interact physically on the cell surface. Using a yeast two-hybrid system, we have shown that the extracellular domain of proHB-EGF and the second extracellular domain of monkey CD9 do indeed interact . The yeast two-hybrid system strategy has been used to examine both intracellular and receptor-ligand protein-protein interactions. The interaction of mammalian growth hormone, prolactin, and vascular endothelial growth factor with their respective extracellular ligand-binding proteins have been observed using yeast two-hybrid sytems [10–13]. The involvement of HB-EGF in various cellular and tissue functions and its presence in extracellular matrices suggested the possibility that it may interact with other extracellular matrix proteins. To test this possiblity we used the extracellular domain of proHB-EGF in a yeast two-hybrid system to screen a monkey kidney cDNA library. In the present report, we have identified two novel extracellular matrix proteins latent transforming growth factor β-binding protein 3 and fibulin-1C that interact with the extracellular domain of proHB-EGF. The initial screening of ≈ 3 × 106 clones of the monkey cDNA library with the bait fusion of GAL4 binding domain fused to the extracellular domain of proHB-EGF yielded 294 colonies that were able to grow on Trp-His-Leu- media and that gave positive β-galactosidase activity in the β-galactosidase filter paper assay. False positives were ruled out by testing the β-galactosidase activity of the library clone alone or the library clone and the GAL4 DNA binding domain plasmid vector together in the yeast host strain. False positives were also ruled out by testing the β-galactosidase activity of the library clone with pVA3 (pGBT9 with a cloned insert). The elimination of these false positive colonies from the initial screening of the cDNA library resulted in a total of 64 colonies whose library clones encoded potentially true interacting proteins with the extracellular domain of proHB-EGF. Some of these cDNA library clones were transformed into the other yeast host strain, Y187, and tested for β-galactosidase activity as a further check that these clones did indeed contain potential protein-interacting partners for the extracellular domain of proHB-EGF. The membrane-bound precursor and soluble forms of heparin-binding epidermal growth factor-like growth factor (HB-EGF) contribute to a variety of cellular developmental processes . The observations of HB-EGF in cell and tissue types have suggested roles for HB-EGF in numerous cellular and tissue events such as: cell movement, extracellular matrix formation, tumor formation and cell adherence . As described above, the membrane-bound precursor of HB-EGF (proHB-EGF) is also the cell-surface receptor for diphtheria toxin (DT) in DT-sensitive cells . Previously we have examined the protein-protein interactions of proHB-EGF with the cell-surface CD9 antigen . The CD9 antigen is found on a wide variety of tissue and cell types and has been reported to be involved in such cellular processes as B-cell development, cell metastasis, platelet activation and adhesion, and cell motility [14, 15]. CD9 antigen is a member of the tetraspanin superfamily and consists of two extracellular domains sandwiched between four highly-conserved hydrophobic transmembrane domains [14, 15]. The second extracellular domain (75–130 amino acids) is larger than the first extracellular domain (20–27 amino acids). Short cytoplasmic domains (5–14 amino acids) are found at both the amino and carboxyl termini of CD9 . As reported previously, we used a yeast two-hybrid system and observed interaction between the second extracellular domain of MkCD9 and the extracellular domain of proHB-EGF . However, despite repeated attempts, using the yeast two-hybrid system, we were unable to show interaction between the amino terminal cytoplasmic domain of monkey CD9 and the cytoplasmic domain of proHB-EGF; these results may reflect the limitation of the yeast two-hybrid system as the insert sizes cloned into the vectors may be too small resulting in Gal4 fusion proteins whose "test subunits" are masked by the Gal4 subunit. This would result in the fusion proteins being unable to recognize each other. The results of screening the monkey cv-1 cDNA library with the bait plasmid pGBT9/DTREx were somewhat surprising in that no portions of the CD9 protein were represented among the proteins found to interact with the extracellular domain of proHB-EGF. These results may reflect improper folding of CD9 protein fragments encoded by cDNA inserts or these results may be due to under representation of the CD9 cDNA in the monkey cv-1 cDNA library. It was also surprising that the extracellular portion of any of the EGF receptor proteins was also not represented among the proteins found to interact with the extracellular domain of proHB-EGF, since the mature protein proteolytically cleaved from proHB-EGF (mHB-EGF) as well as the membrane bound form are known to interact with the EGF receptor. The positive interaction of the fragment of the latent transforming growth factor β-binding protein-3 (LTBP-3) with the extracellular domain of proHB-EGF was of great interest (Additional file 1). Recently it has been reported that treatment of EGF-responsive, nontransformed rat intestinal crypt cell line RIE-1 cells with TGF-β resulted in an increased level of expression of HB-EGF . LTBP-3 is a protein that is ubiquitous in tissues and cells. Human LTBP-3 (Fig. 1) and mouse LTBP-3 contain 1242 and 1251 amino acids, respectively, and each protein has five structural domains. Each has a signal sequence (55 amino acids and 49, respectively), a second domain containing an EGF-like repeat, a proline/glycine rich region, a fibrillin motif , an EGF calcium-binding repeat, and a TGF-β repeat (390 and 389 amino acids, respectively), a third domain containing a proline/glycine rich region (113 and 111 amino acids, respectively), a fourth domain containing numerous calcium-binding type II EGF-like modules (D/N)(I/V)(D/N)(E/D)C1 (678 and 677 amino acids, respectively) and a fifth carboxyl-terminal domain (5 and 21 amino acids, respectively) (human LTBP-3 information was obtained from the GenBank database accession no. AF135960.2; ). Colony hybridization experiments using the LTBP-3 probe (see materials and methods) and the monkey cv-1 cDNA library yielded a set of six (two identical) overlapping clones (Fig. 2). The amino acid sequence derived from the nucleotide sequence obtained for the monkey LTBP-3 sequence (GenBank accession number AF395658) shows it to share 98.6 % identity with the human LTBP-3 amino acid sequence (GenBank accession number NP_066548) and 86.7 % identity with the mouse LTBP-3 amino acid sequence (GenBank accession number NP_032546). Diagrammatic representation of the human LTBP-3 protein. Note that for the amino acid sequence derived for the monkey LTBP-3 (Mk LTBP-3), the monkey, mouse and human LTBP-3 proteins have the same structural features. Symbols represent structural features of the protein: cysteine-rich regions, patterned octagons; proline/glycine rich region, solid line; fibrillin motif, open rectangle; calcium-binding type II EGF-like modules, open octagons; cysteine-rich TGF-bp repeats, dotted punched tape symbol; TGF-bp-like repeat, wavy lined punched tape symbol. 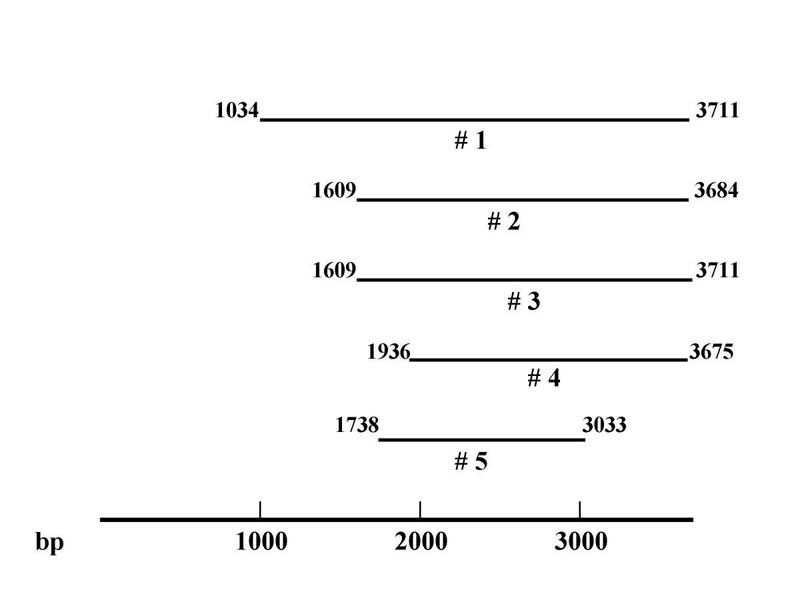 The numbers 1-5 represent different domains of the protein. The construct insert of pGAD424/LTBP-3 EGF #1-8, containing the region of Mk LTBP-3 that interacts with the extracellular domain of proHB-EGF (DTREx), is shown as a forward slashed box. Overlapping monkey cDNA clones containing monkey LTBP-3 sequence. The numbers displayed next to each clone represent the nucleotides of the cDNA clone. The numbering system is based on that presented for the mouse LTBP-3 cDNA sequence in which the A of the intitiator Met codon is nucleotide 1 (Yin et al. 1995). The fusion proteins encoded by each of the cDNA clones demonstrated interaction with the extracellular domain of proHB-EGF when tested for β-galactosidase activity using the yeast two-hybrid system assay. The presence of the calcium-binding EGF-like modules in monkey LTBP-3 is noteworthy. It is well established that EGF-like modules are important structural features found in many extracellular proteins and that these modules enable numerous protein :protein interactions; the binding of EGF-like modules in laminin to nidogen  and the interaction of EGF-like modules within fibrillin monomers [20, 21]. Calcium may be required for some of these protein interactions. At the time of writing, there have not been any reported interactions of these EGF-like modules in LTBP-3 proteins with specific proteins. It is interesting that the combination of colony hybridization and yeast two-hybrid screens used in this study to identify proteins that interact with the extracellular domain of proHB-EGF yielded independent GAL4-LTBP-3 fusion proteins that all contained these calcium-binding type II EGF-like domains (Fig. 2). A constructed clone, pGAD424/LTBP-3 EGF#1-8, that contained calcium-binding type EGF-like modules #1–8 fused to the GAL4-activation domain (see Fig. 1 and materials and methods) was tested using the yeast two-hybrid system and found to interact with the extracellular domain of proHB-EGF (Additional file 1). These negatively-charged EGF-like modules of LTBP-3 may interact efficiently with the positively-charged heparin-binding domain of both the membrane-bound and soluble forms of HB-EGF. The amino acid sequence of the heparin-binding region of HB-EGF (21KRKKKGKGLGKKRDPCLRKYK41)  has been shown to have a strong affinity for heparin and may influence the interaction of this growth factor with cell-surface negatively charged heparan sulfate proteoglycans . It remains to be seen whether specific/all of the EGF-like modules are required and whether calcium is needed for the interaction of HB-EGF with LTBP-3. The LTBP-3 protein is secreted as a soluble protein from the cell surface into the extracellular matrix. Two of the proposed functions of LTBP proteins include protecting TGF-β from premature proteolytic cleavage and targeting TGF-β to its appropriate cell-surface receptor. During cellular synthesis of TGF-β, a small latent complex containing the latency-associated peptide and the mature TGF-β is synthesized. This small latent complex may be secreted inefficiently from the cell surface at relatively slow rates . However, when the small latent complex is bound by the latent transforming growth factor β-binding protein via a disulfide bond to the latency-associated peptide, the result is the formation of a large latent complex which may be secreted efficiently and at a relatively high rate compared to the small latent complex . Latent TGF-β is then released from the extracellular matrix via proteolytic cleavage from the large latent complex, and the resulting active TGF-β is now able to bind to the appropriate TGF-β cell-surface receptors . It is well accepted that TGF-β is important for the regulation of extracellular matrix synthesis and degradation. The presence of TGF-β increases the expression of such extracellular matrix proteins as fibronectin, the fibronectin receptor, vitronectin, tenascin, elastin, thrombospondin, collagen, and biglycan [25–32] and also inhibits expression of proteases that degrade the extracellular matrix while stimulating the expression of protease inhibitors [33–36]. It is interesting to note that although Bulus and Barnard  showed that TGF-β treatment of R1E cells resulted in increased level of HB-EGF expression, they did not report any direct physical interactions between the growth factors TGF-β and HB-EGF. It may be that LTBP-3 provides a physical link between soluble mHB-EGF and TGF-β. Possible functions for the apparent interaction of mHB-EGF with LTBP-3 include the targeting of the TGF-β within its protective large latent complex to its appropriate TGF-β cell-surface receptor, or the targeting of the TGF-β large latent complex to the EGF receptor via binding of mHB-EGF to the appropriate EGF receptor. These are reasonable functions for the role of the proposed mHB-EGF :LTBP-3 protein:protein interactions as the expression of both mHB-EGF and TGF-β is important during extracellular matrix formation in wound healing [1, 25]; it has been suggested that the coordinated activities of HB-EGF and TGF-β regulate the wound healing process . The extracellular domain of proHB-EGF interacts with monkey fibulin-1C (Additional file 1). Fibulin-1 is a calcium-binding extracellular matrix glycoprotein that is associated with various connective tissues, basement membranes and blood [37–39]. Splicing of the C terminal domain of fibulin-1 can lead to the expression of different variants of fibulin-1 (A-D) . The amino acid sequence of the human fibulin-1C protein encodes five domains: a signal sequence (35 amino acid residues), three anaphylatoxin type I repeats (108 residues), an adjoining sequence (33 amino acid residues), nine calcium-binding type II EGF-like modules (387 amino acid residues), and a carboxyl domain (116 amino acid residues) . The amino acid sequence derived from the nucleotide sequence obtained for monkey fibulin-1C (GenBank accession number AF395659) shows it to share 97.2 % identity with the amino acid sequence for human fibulin-1C (GenBank accession number NP_001987). The EGF-like modules found in fibulin-1 are instrumental in a variety of extracellular protein:protein interactions. Fibulin-1 has been reported to interact with such extracellular matrix proteins as fibronectin, laminin, nidogen, aggrecan and versican [39–42]. Fibronectin is a glycoprotein found as multimers in insoluble form in the extracellular matrix. Fibronectin contains three types of homology sequences, I-III; type I sequences bind heparin, Staphylococcus aureus, fibrin, and cell surfaces, type II sequences bind collagen and gelatin, and type III sequences bind DNA, cell surfaces, heparin, and fibulin-1 [40, 43]. Fibulin-1 interacts with fibronectin through a heparin-binding region in type III13 repeat; the binding of fibulin-1 to this site is independent of the binding of heparin as addition of exogenous heparin does not inhibit fibulin-1 binding to fibronectin . The fibronectin-binding site in fibulin-1 is located in EGF-like modules 5 and 6 ; the binding of fibulin-1 to fibronectin is a heterotypic interaction in which an EGF-like module binds to a non EGF-like domain (the type III13 fibronectin repeat) . Laminin is a glycoprotein composed of three chains, A, B1, and B2 in a cross-shaped molecule; this protein is found in basement membranes where it interacts with other such components as collagen IV, heparan-sulfate proteoglycan, and nidogen . Laminin contains EGF-like modules in the amino-terminal region of the A, B1, and B2 chains . Surprisingly, these modules do not appear to be involved in the binding of fibulin-1. The site of fibulin-1 binding to laminin maps to the carboxyl-terminal segment of the laminin A chain which consists of five basic tandem repeats containing conserved glycine and cysteine residues [39, 46]. The binding site of laminin to fibulin-1 maps to the calcium-binding type II EGF-like modules of fibulin-1 . Nidogen is a basement membrane protein composed of three globular domains G1-G3 and two linking sequences; domain G1 is joined to domain G2 through a flexible link and domain G2 is connected to domain G3 by a rod-like element consisting of EGF-like modules . Nidogen1 is an important structural component of tertiary complexes with other such extracellular components as laminins, collagen IV, perlecan, and fibulins . Fibulin-1C binds to nidogen1 through domain G2 of nidogen . The nidogen binding site of fibulin-1C includes the type II EGF-like modules 6–9 and the carboxyl-terminal domain . Aggrecan and versican are aggregating proteoglycans that are key constituents found in the extracellular matrix . Both proteoglycans contain amino-terminal hyaluronic acid-binding regions, central core glycosaminoglycan attachment domains, and carboxyl-terminal domains containing EGF-like modules (one in aggrecan and two in versican), C-type lectin like modules and complement regulatory protein-like modules [49, 50]. Fibulin-1 exhibits calcium-dependent binding to the carboxyl-terminal domain of aggrecan and versican . The binding site of aggrecan to fibulin-1 maps to the type II EGF-like modules 8–9 and the carboxyl-terminal domain of fibulin-1 . The binding site of versican to fibulin-1 maps to the type II EGF-like modules 2–8 of fibulin-1 . Fibulin-1 has been reported two exhibit calcium-dependent self-association [40, 44]. The two self-association sites map to type II EGF-like modules 5 and 6 and to a cryptic site in the amino-terminal region of fibulin-1 [40, 44]. As described above, the calcium-binding type II EGF-like modules of fibulin-1 are used in various extracellular matrix interactions. It is noteworthy that these modules may interact with other EGF-like modules or with non EGF-like modules. The yeast two-hybrid system and colony hybridization screens used in this study indicated that a monkey cDNA clone (Fig. 3), containing half of the anaphylatoxin type I repeats, an EGF-adjoining sequence, calcium-binding EGF-like modules and a carboxyl-terminal fibulin-type module, demonstrated interaction with the extracellular domain of proHB-EGF (Additional file 1). To see if the any/all of the calcium-binding EGF-like modules were necessary for this interaction, two clones were constructed. A clone, pGAD424/Fib-1C EGF #5-COOH, that contained calcium-binding type EGF-like modules #5–9 and the carboxyl-terminus of fibulin-1C fused to the GAL4-activation domain (see Fig. 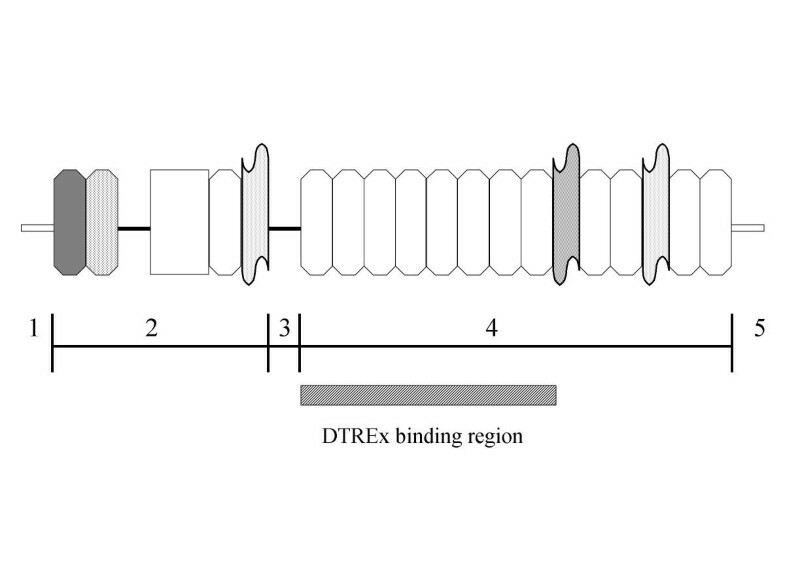 3 and materials and methods) was tested using the yeast two-hybrid system and found to interact with the extracellular domain of proHB-EGF (Table 1). In constrast, the construct, pGAD424/Fib-1C EGF#1-5, that contained calcium-binding type II EGF-like modules #1–5 fused to the GAL4 activation domain (see Fig. 3 and materials and methods) did not interact with proHB-EGF (Additional file 1). It remains to be determined which of the regions within the EGF-like modules #5–9 (e.g. hydroxylation and glycosylation sites) and the carboxyl-terminus of fibulin-1C are necessary for the interaction with proHB-EGF. The interaction of fibulin-1C may map to the heparin-binding region of the extracellular domain of proHB-EGF or it may map to the EGF-like module of proHB-EGF or it may map to both of these regions within proHB-EGF. To test whether the fibulin-1C interaction with proHB-EGF maps to the heparin-binding region, a construct, pGBT9/prodelHB-EGF, containing amino acid residues Asp106-His159 (the entire EGF like region of proHB-EGF and 18 out of 32 residues of the heparin-binding region)  was used in the yeast two-hybrid system (see materials and methods). Construct pGBT9/prodelHB-EGF was unable to interact with pGAD424/Fib-1C EGF#5-COOH (data not shown). Caution must be used with this result however, as the size of the cloned prodelHB-EGF region is small, encoding just 54 amino acids; this may have resulted in a Gal4 fusion protein in which the EGF epitopes in prodelHB-EGF are hidden by the Gal4 subunit and thus not recognized by the GAL4 fusion partner protein (GAL4/Fib-lC EGF #5-COOH). Diagrammatic representation of the human fibulin-1C protein (modified after Argraves et al. ). Note that for the derived amino acid sequence obtained for the monkey fibulin-1C protein, the human and monkey fibulin-1C proteins have identical structural features. Symbols represent the following structural features: anaphylatoxin type I repeats, diamonds; potential N-glycosylation site, small circle; EGF-adjoining sequence, dotted oval; calcium-binding type II EGF-like modules, open octagons; potential Asn/Asp hydroxylation site, triangles, potential o-glycosylation site, inverted triangles; fibulin-type module, large hexagon. The construct insert of pGAD424/Fib-1C EGF #1–5 is represented by a dotted box. The construct insert of pGAD424/Fib-1C EGF #5-COOH, containing a region of fibulin-1C that interacts with the extracellular domain of monkey proHB-EGF (DTREx), is represented by a forward slashed box. Fibulin-1 is incorporated into fibronectin-containing matrix fibers [44, 51]. Although a distinct function for fibulin-1 has not yet been described, it is conceivable that fibulin-1 is important for cell adhesion and migration along protein fibers within the extracellular matrix. Fibulin-1 may serve to anchor the mHB-EGF to its fibers as it migrates through the extracellular matrix. As explained above, mHB-EGF has been reported to be involved as a structural protein in such tissue developmental processes as wound healing and it is feasible that the direct physical association of mHB-EGF with fibulin-1 may be useful in the tissue remodeling of a wound site and in scar formation. The results presented in this paper now suggest that there is potential in carrying out experiments to further delineate the molecular interactions between proHB-EGF and LTBP-3 and between proHB-EGF and fibulin-1C. A transitional step in this process will be the expression and purification of these proteins. In order to rule out false positives that may have resulted from the yeast two-hybrid system, experiments that provide co-immunoprecipitation data or solid phase binding results of the interaction of these proteins will be useful. The interaction of EGF-modules with either non EGF-like modules (e.g. the EGF-like modules of fibulin-1C interacting with the heparin-binding region of fibronectin) or with EGF-like modules (e.g. the interaction of fibulin-1C with aggrecan and versican) between extracellular matrix proteins argues for the interaction of the EGF-modules containing within fibulin-1C and LTBP-3 with either the heparin-binding region or with the EGF-like domain of HB-EGF. In summary, we have shown the interaction of two novel proteins with the extracellular domain of proHB-EGF using a yeast two-hybrid system. The interactions of LTBP-3 and fibulin-1C with the extracellular domain of proHB-EGF may provide further insights into the roles that these proteins play in cellular and tissue development processes. The trafficking of such growth factors as HB-EGF and TGF-β and structural proteins within the extracellular matrix is important in wound healing processes. Therefore, the interactions of HB-EGF with LTBP-3 and fibulin-1C described in this study suggest novel functions for HB-EGF between cell-surfaces and tissue surfaces. The plasmid vectors, pGBT9, pGAD424, pTD1, pVA3, the monkey cv-1 cDNA library in pGAD10, and the S. cerevisiae strains Y187 and Y190 were obtained from Clontech. The cv-1 cDNA library was amplified and stored as per the manufacturer's instructions. Unless otherwise noted, all chemicals and reagents were obtained from Sigma. E. coli strain DH5α was used as the host strain for cloning. The extracellular domain (amino acid residues Glu24-His159) of monkey proHB-EGF (GenBank accession number Q09118)  was amplified by PCR using primers MkHB-EGFex(5') TCGGCACTGGTGGAATTCGAGAGCCTGGAG and MKHB-EGFex(3') CACAGCCAGGATGGATCCATGGTCATAGGT. The PCR product was digested with Eco RI and Bam HI and ligated into the Eco RI and Bam HI restriction sites of pGBT9 and pGAD424 to produce constructs pGBT9/proHB-EGFEx and pGAD424/proHB-EGFEx, respectively. The pGBT9/proHB-EGFEx construct was used as the bait construct in the yeast two-hybrid screen to identify extracellular proteins that interact with the extracellular domain of proHB-EGF. The EGF-like region (amino acid residues Asp106-His159) of monkey proHB-EGF  was amplified by PCR using primers MkHB-EGF 5'CTAGGGAAGGAATTCGACCCATGTCTTCGG and MkHB-EGF 3'CACAGCCAGGATGGATCCTCAATGGTCATAGG. The PCR product was digested with Eco RI and Bam HI and ligated into the Eco RI and Bam HI restriction sites of pGBT9 to produce construct pGBT9/prodelHB-EGF. All plasmid constructs were transformed into the S. cerevisiae strains, Y187 and Y190, using the lithium acetate protocol as per the manufacturer's instructions. Y190 transformants containing pGBT9/proHB-EGFEx and pGAD10/cv-1 library were plated onto Trp-Leu-His- agar plates. The triple auxotrophic transformants were tested for β-galactosidase activity using the filter paper assay described in the manual provided by Clontech. A positive control of Y187 or Y190 containing both plasmids pTD1 and pVA3 together was included in every β-galactosidase assay. A negative control of Y187 or Y190 containing both plasmid vectors, pGBT9 and pGAD424, was included in all β-galactosidase assays. Each construct from the cDNA library that tested positive for both lacZ and his reporter gene expression was also tested for the ability to activate directly β-galactosidase/his reporter gene transcription without the presence of the bait construct, pGBT9/proHB-EGFEx. False positives were eliminated using this screening assay. Potential true positive clones were sequenced using primers GAD10SEQ 5'TACCACTACAATGGATG and GAD10cSEQ 5'GTTGAAGTGAACTTGCGGGG with the automated DNA sequencing facilities available at our Institution. Comparisons of the obtained sequences were made using the GENBANK database. The sequences for monkey LTBP-3 and monkey fibulin-1c have been submitted to the GenBank database under the accession numbers AF395658 and AF395659 respectively. Sequence alignment and identity was determined using the Mac Vector sequence analysis program. The calcium-binding type II EGF-like modules #1–8 of monkey LTBP-3 (Fig. 1) were amplified by PCR using primers GAD10SEQ 5'TACCACTACAATGGATG and LB3priLQGSYVC 5'CGCGGATCCTCAACACACATAGGAGCCCTGAAG. The PCR product was digested with Eco RI and Bam HI and ligated into the Eco RI and Bam HI restriction sites of pGADA424 to produce construct pGAD424/LTBP-3 EGF#1–8. The construct was sequenced as described above using the primers pGAD10SEQ and pGAD10cSEQ. The calcium-binding type II EGF-like modules #1–5 (Fig. 3) of monkey fibulin-1C were amplified by PCR using primers Fib5priYLNDRC 5'CGAATTCTATCTGAATGACCGCTGC and Fib3priCAPPAE 5'CCGTCGACTCACTCAGCAGGTGGCGCGCA. The calcium-binding type II EGF-like repeats #5–9 (Fig. 3) and the carboxyl terminus of monkey fibulin-1C were amplified by PCR using primers Fib5priCAPPAE 5'CGAATTCTGCGCGCCACCTGCTGA and Fib3priFVSAEL 5'CCGTCGACTCAGAGCTCTGCAGACACAAA. The PCR products were digested with Eco RI and Sal I and ligated into the Eco RI and Sal I restriction sites of pGAD424 to produce constructs pGAD424/Fib-1C EGF#1-5 and pGAD424/Fib-1C EGF#5-COOH respectively. The constructs were sequenced as described above using primers pGAD10SEQ and pGAD10cSEQ. A random primed P33 labeled 1.8 kb DNA probe to the region of LTBP-3 gene containing domain 4 was prepared using the High Prime Labeling Kit from Roche Molecular Biochemicals. Colony hybridizations were performed on E. coli colonies containing the monkey cv-1 cDNA library. Colony lifts on zeta probe membranes (Bio-Rad) were performed and the colonies were denatured and neutralized as described by Sambrook et al. air dried and then UV cross-linked using a Stratagene crosslinker. The probe was allowed to hybridize to the colony DNA at 42°C overnight as described by Sambrook et al. . The membranes were then rinsed and washed twice for 5 minutes in 2X SSC/0.1% SDS at room temperature, twice for 15 minutes in 0.1X SSC/0.1 % SDS at 68°C, and once for 15 minutes in 0.1X SSC/0.1% SDS at room temperature. The colony blots were then wrapped in saran wrap and exposed to X-ray film at room temperature for 24 h at -80°C. The above strategy was used to perform colony blot hybridization screening on the monkey cv-1 cDNA library using a ~750 bp P33-labeled probe to a region of the fibulin-1C gene containing most of the type I anaphylatoxin repeats and almost all of the type II EGF-like repeats (Fig. 3). This research was supported by U.S. Public Health Service Grant AI-16805. We would like to acknowledge the technical assistance of Allen S. Dyke and Kathy N. Ivey. We thank Dr. E. Davis for helpful discussions of this research.